Glass Dome display will hold 104 military challenge coins. The glass dome is 12" wide & 10" tall. Glass Dome display will hold 104 military challenge coins. The glass dome is 12” wide & 10” tall. The total height with the base is 11” tall. The Oak base is 12” in diameter. The display has 4 disks with 21 slots, 1 disk with 14 slots and 1 disk with 6 slots for coins 1 ½” -2” coins (coins not included). 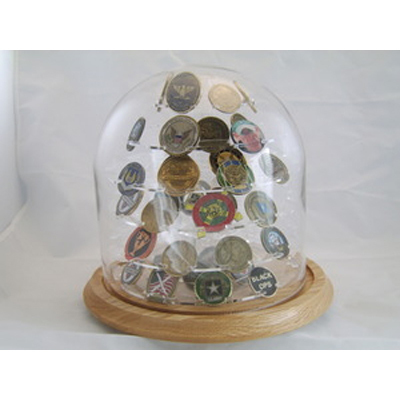 Order your Challenge Coin Glass Dome Display Case from Flags Connections today and you will save time and money. When you order the M104 Glass Dome Display Case, your order will usually be shipped out the next business day. Every Challenge Coin Glass Display Case from Flags Connections is made in the United States by veterans for heroes. The coins, that were originally offered to select military personnel, have recently been made available to the public sector. Besides challenging, Challenge Coins were also used as awards and rewards for those who performed outstanding service. Originally used to build morale among the troops, it is believed that the tradition started during the Vietnam War when Challenge Coins were first given to those who served in the Special Forces units. The tradition spread and in the early 1980’s was welcomed by the 75th Ranger Regiment. As officers began to be reassigned with their careers progressing, they were awarded unit coins for acts that were worthy of recognition. Challenge Coins were uncommon until the Gulf War in 1990-1991, and have grown tremendously in popularity. Challenge Coins were also presented to the gunners after they graduated from Air Force Technical Training School honoring them with entry into the prestigious, “Gunners Association.” When bombers were used, a Challenge Coin was presented as a show of courage and strength, which reflected the official mascot of the gunner, the Bulldog. The M104 Glass Dome Display case can hold up to 12 military or civilian Challenge Coins. The glass dome measures 4” wide and is 7” tall making the total height of the M104 Glass Dome Display case 7” tall. The gorgeous handcrafted walnut base measures 5” in diameter with the display having the ability to hold 12 military or civilian Challenge Coins. The display features three disks with four slots. These slots can hold 1 ½” to 2” coins which are not included in the M104 Glass Dome Display case from Flags Connections. The highest quality M104 Glass Dome Display case from Flags Connections has the ability to show Challenge Coins off from any spot in the room. With a 360° view, your Challenge Coins will take pride and place on any shelf or table. If you have a friend or family member that is a veteran or currently serving in the army, air force, marines, navy or National Guard give them a the gift of a M104 Glass Dome Display case from Flags Connections that can house their memories and keep them safe.